If the Motorola Droid Razr Maxx ($300 with a two year contract from Verizon; price as of 1/27/12) looks familiar, that’s because it is virtually identical to the Droid Razr. The big difference between the Razr Maxx and the Razr is battery life: Motorola claims that the Razr Maxx gets 21 hours of talk time on a charge. One of the weaknesses I found with the original Razr is that battery life drained rapidly over Verizon’s LTE, a common problem among the carrier’s fleet of 4G phones. Are Motorola’s claims true? Does the Droid Maxx’s battery hold up over 4G? While we didn’t finish talk time testing in time for this review (we will update once it is complete), the Razr Maxx’s handled video streaming and gaming over LTE with very little strain on the battery. (Editor’s Note: The Software, Display and some of the Design sections of this review were taken from the original Droid Razr review as the phones are almost identical). The Droid Razr Maxx is pretty much identical to the Droid Razr in design however it is slightly thicker and heavier. But really, the difference isn’t too noticeable. The Razr Maxx weighs 5.11 ounces and measures 0.35 inches thick while the Razr weighs 4.48 ounces and measures 0.28-inches thick. 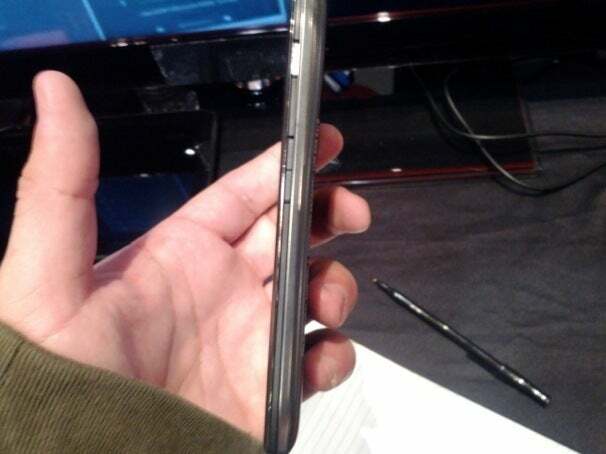 The Razr Maxx is still incredibly thin and is on par in slimness with the Samsung Galaxy Nexus, also on Verizon. The soft-touch back is made out of Kevlar, a material found in high-end speedboats, bulletproof jackets, and bicycle tires. According to Motorola, Kevlar is five times stronger than steel. Using Kevlar on a phone seems a bit, well, weird, but I was surprised with how delicate it felt and how attractive it looked. The solid feel comes from the Droid Razr’s stainless steel core. It also has splashguard technology, which will protect it if you happen to get caught in the rain or spill something on your phone. We’ve knocked other Motorola smartphones, such as the Photon (Sprint) and the Droid Bionic (Verizon) in the past for its PenTile displays. 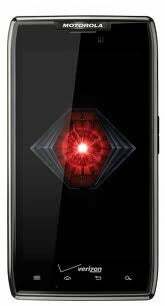 The Droid Razr, however, ships with a 4.3-inch qHD (Quarter High Definition), 960-by-540-pixel Super AMOLED display. According to Motorola, the Super AMOLED technology should solve some of the battery issues associated with LTE phones. This technology has lower current consumption, which helps to conserve battery life. The Droid Razr’s display has excellent viewing angles and visibility outdoors, two trademarks of Super AMOLED technology. Blacks are very deep and whites are bright, but colors look a bit oversaturated (another trademark of Super AMOLED display technology. I did a side-by-side comparison of the Droid Razr against the iPhone 4S. The iPhone 4S has a slightly higher resolution at 960-by-640, with a pixel density of 330 pixels per inch (I could not find any pixel density information for the Razr). While I appreciated the extra screen real estate on the Razr, the iPhone 4S’s 3.5-inch display looked sharper, with better color accuracy. As I mentioned previously, we haven’t yet lab tested Motorola’s claims that the Droid Maxx can withstand 21 hours of talk time. I did some informal tests over 4G, however and was quite impressed with the Droid Maxx’s battery life. After playing Minecraft for 20 minutes, battery life decreased only 5%. I also ran the State of the Union address on YouTube (which runs for 1:05:13) in HQ (high quality) and battery life only dropped by 20%. I played the game Madden NFL 12 (which comes preloaded on the Razr Maxx) for 10 minutes and the battery didn’t drain at all. Not only did battery life hold strong in these games, but performance was excellent. The graphics look terrific on the Razr Maxx’s display and gameplay was smooth without any glitches. Overall, this is an excellent gaming phone. The Razr’s 1.2GHz dual-core TI OMAP 4430 processor scored a notable 1040 on the Vellamo mobile benchmarking app for Android (made by Qualcomm). Call quality was very good over Verizon’s network in San Francisco. I got coverage almost everywhere I went and never experienced any dropped calls. My friends and family sounded loud and clear, with no static or distortion. The Droid Razr runs Android 2.3.5. It isn’t a pure version of Android, but it isn’t Motorola’s busy (and often annoying) custom overlay/service, MotoBlur. It does retain some of the MotoBlur widgets. The interface is almost identical to that of the Droid Bionic, but with a few tweaks. The widgets are resizable, and you can scroll through them; in the calendar widget, for example, you can scroll through a whole day’s worth of events rather than viewing one event at a time. Like the Bionic, you get the ZumoCast app/service, though here it has been renamed MotoCast. MotoCast lets you access remote files on your PC without having to upload or sync your files. You can access everything from PowerPoint files to your iTunes playlists on your Razr. Even though the Razr has plenty of capacity (1GB of RAM, 16GB of on-board storage, and a preinstalled 16GB MicroSD card), I find it nice to be able to access videos, documents, photos, and other media files without having to download them to the device or upload them to a cloud service. Motorola is determined to solve the LTE battery life situation. Smart Actions, a new app, lets you set reminders to notify you when you should recharge your phone (for example, when you go to bed). If you forget to plug your phone in, you can set a Smart Action called “Nighttime Battery Saver,” which adjusts your phone’s network and screen settings to make your battery last longer the next day. Smart Actions aren’t just about saving battery life. You can create different profiles (Work, Home, Workout, and so on) and set rules for each scenario. If you don’t want your phone to ring out loud when you’re at work, you can set a rule called Quiet Location so your phone automatically goes into silent mode during work hours. Overall, Smart Actions is an easy-to-use, clever app. Although you’ll have to spend a bit of time setting up the rules for each profile, once that's done, Smart Actions will make all the adjustments for you. The 8-megapixel camera on the Razr Maxx is identical to the original Droid Razr. And unfortunately, image quality isn’t the best. All of my photos seemed to have a bit of a dark cast to them--even photos taken in natural light. Details weren't as sharp as I would have liked, either. The flash tends to blow out colors and details quite a bit, so use it only when absolutely needed. Like the Droid Bionic and the Photon, the Droid Razr is compatible with a slew of accessories, such as the LapDock 500 Pro, a laptop-like portal for the phone. The LapDock 500 Pro has a 14-inch display and a front-facing camera. When you connect to the Webtop dock, you can access the full Firefox browser as well as lots of specially made productivity apps. Other accessories include an HD Station, a vehicle navigation dock, and a standard dock. The Droid Razr Maxx greatly improves upon what was perhaps the biggest weakness of the Droid Razr: battery life. If you plan on watching a lot of video or doing some heavy duty gaming on your phone, the Razr Maxx is a good match for you. If you’re looking to save money, however, you might opt for the original Razr; it costs $100 less than the Razr Maxx.